In the hustle and bustle of modern life it is more important than ever to find ways to become attuned to our inner state and what is happening around us. We are bombarded with sensory stimuli that prevent us from being fully present in the moment – with ourselves, others and our environment. When you consider its far reaching benefits, it’s no real surprise that more and more of us are striving to achieve mindfulness. Can we achieve mindfulness through artistic pursuits? Most definitely, yes. There are many ways in which this state can be achieved: focused breathing, observation, meditation – even mindful creativity. Humans began adorning caves with art more than thirty thousand years ago and our obsession with observing and making art continues to this day. The exponential rise in popularity of mindfulness coloring is a testament to our on-going love affair with creative pursuits. In this article we will look at mindfulness and its relationship to creativity, the benefits of practicing mindfulness through art, and some of the ways you can incorporate creative mindfulness into your daily life. What is a Mindfulness Jar? Mindfulness is a state of sustained and alert awareness resulting from being focused on the present moment (Brown & Ryan, 2003). The development of mindfulness is a reliably effective method to reduce symptoms of anxiety, stress, and depression, while simultaneously encouraging improvements in self-regulated behavior, cognitive, emotional, and interpersonal functioning (Lebuda, Zabelina, & Karwowski, 2015). For these reasons and many more, mindfulness is an important skill to develop. The aim of traditional mindfulness techniques is to achieve a state of alert, focused relaxation by paying deliberate attention to thoughts and sensations. By looking at their many shared characteristics and outcomes, one can see how creativity and mindfulness are interconnected. Preparation – This first and most important stage is, in essence, mindful thinking. A problem is consciously investigated using imaginative, divergent thinking (a method of generating creative ideas by exploring the many possible solutions). Incubation – The stage during which the problem is not consciously being thought about. Illumination – The appearance of a solution in an ‘aha’ moment. Verification – If the solution is found to be unsatisfactory the four creative stages can be repeated from the beginning. In many ways, mindfulness encourages creativity and creativity encourages mindfulness. According to De Dreu, Nijstad, Baas, Wolsink, & Roskes (2012) a number of competencies are associated with both mindfulness and creativity. For instance, practicing mindfulness reduces the fear of judgment; this lack of fear is conducive to creativity – indicating that mindfulness may be directly and indirectly related to creative thinking and creative achievement. If we consider mindfulness as encapsulating a state of open-minded, moment-to-moment awareness and involvement it is clear that these factors can also be attributed to the focus required when engaged in creative pursuits. Artists of all abilities can find themselves occupied with tiny, almost unnoticeable details. While mindfulness techniques focus one’s attention on the body or one’s breathing, in art-making the focus is on creating in the moment. When drawing everyday objects like an orange or flowers, the artist may dedicate a substantial amount of time observing the texture and color of an object they may have used every day for years and yet never truly noticed. It may come as no surprise to those who already engage in artistic pursuits that practicing mindfulness through art has a multitude of benefits and positive outcomes. The beauty of mindfulness is that it can be practiced in most facets of life – art is just another path to mindfulness for those looking at alternative ways to improve their adeptness in the area. The following are just some of the ways in which you can benefit from practicing mindfulness through art. DeLue (1999) investigated the effect of coloring mandalas on relaxation by recording physiological changes. The study found that the coloring of mandala designs decreased heart rate and blood pressure, while simultaneously improving some symptoms of stress and anxiety. Mandala drawing and coloring has been found to reduce negative mood states and actively serves as a mood enhancer (Babouchkins & Robbins, 2015). Kalmanowtz & Ho (2016) examined the effect of art and mindfulness on trauma recovery. Their study indicated that a combination of the two helped individuals build strategies to support resilience after extreme and traumatic experiences. Interactions with art are related to increased visual literacy and observational skills. Research by Naghshineh (2008) found that both mindfulness and art are positively correlated with an increase in attention skills. These abilities improved further with continued engagement in creative pursuits. The process of art creation leads to an increase in self-knowledge and awareness of the world around us. The self-expressive, reflective, and observational nature of art allows us to recognize ourselves and our experiences in the art we create (Allen, 1995). Peterson (2014) suggested that mindfulness-based art therapy (MBAT) improves the attention, memory, decision-making skills and the physical and mental well-being of cancer patients, even after a relatively short eight-week program. Art-based mindfulness activities promote resilience in children who come from “at-risk” backgrounds. Schonert-Reichl (2010) examined alternative mindfulness techniques aimed at children lacking the communication skills required to express their thoughts and feelings verbally. The findings suggest that creative mindfulness activities assisted in the development of self-awareness and resilience, while affording opportunities to think in different ways, to focus and relax more. Both mindfulness and art creation are linked to flow state. The defining feature of flow state is the intense experiential involvement in moment-to-moment activity. According to Csikszentmihalyi (1990), it can only be achieved through an individual’s effort and creativity. Much like mindfulness and creativity, flow requires deep concentration, focused attention, and full engagement in the present. Research indicates that 47% of the time, we do not think about what is happening in the present moment. Additionally, a wandering mind has been linked to greater unhappiness, regardless of whether the mind wanders to pleasant or unpleasant thoughts (Killingworth & Gilbert, 2010). From its early beginnings in the teaching of Buddhism more than two millennia ago, the concept of mindfulness migrated to the West and saw considerable increases in popularity by the 1950s and 1960s. Many artists and psychology professionals of these decades became interested in Eastern schools of thought and philosophy, with some practicing Buddhism themselves and others simply being intrigued by its concepts. Jung (1965) believed mandalas had a soothing effect and observed that mandala-type images repeatedly appeared in the drawings of the mentally ill. The drawing of mandalas was often incorporated into the treatment of his clients. Singer (1994) described a case in which mandala drawing was deemed critical to the successful treatment a patient experiencing distress from recurring dreams. The individual experienced difficulties when attempting to verbally express the emotions he was experiencing or the impact the dreams were having on his day-to-day life. He was asked to draw pictures in the form of mandalas and in a short period of time began engaging in verbal associations between what he had drawn and the dreams that troubled him. More recently, new art therapy practices have emerged, such as Mindfulness Based Art Therapy (MBAT) and Mindfulness Exploration of Art Materials (MEAM). MBAT is a growing form of art therapy that combines art therapy exercises with a curriculum drawn from multiple programs designed to increase mindfulness. Peterson (2010) investigated the use of MBAT and MEAM exercises and discovered that reflective explorations of art materials assisted in the development of mindfulness. In this study, participants were asked to hold a sheet of paper in their hands and describe what they felt, to bring a pencil to their nose and describe what they could smell. That is to say, they were asked to pay deliberate attention to the experience of interacting with each art material. Results indicated that spontaneous mind-wandering (experiencing unintentional engagement of unguided thoughts) decreased the likelihood of creative performance, whereas deliberate mind-wandering (an effortful, intentional engagement of unguided thoughts) positively predicted creative performance. Furthermore, it was suggested that deliberate mind-wandering and mindfulness predicted creative behavior, both alone and in combination, suggesting a complex interdependence between the two within the creative thinking process. As we search for ways to cultivate mindfulness, there is an almost innate understanding that engagement with the arts is a valuable route to take. One example of this phenomenon is seen in the increasing interest in mindfulness coloring. Mindfulness coloring has become a niche market, with adult coloring books accounting for an almost 7% increase in adult nonfiction book sales in 2015 (Milliot, 2016). Unlike the coloring books of your childhood, mindfulness coloring books are often more abstract, require more dexterity, and contain calming illustrations with intricate patterns (Barrett, 2015). The fundamental concept of mindfulness coloring is that the very act of coloring pre-drawn illustrations provides an opportunity to suspend our inner dialogue and engage in an activity that disregards the flow of negative thoughts that can dominate our lives. Not to be confused with art therapy which is facilitated by a qualified therapist, mindful coloring is designed to provide an opportunity to spend time in a focused state, undertaking a creative activity that can have a calming, meditative effect. Carl Jung is credited as being one of the first to pioneer this use of coloring as a form of meditative therapy. His focus was on the drawing and coloring of mandalas – circular designs with concentric shapes – which represent wholeness in ourselves, and in the universe. Taking part in enjoyable activities to de-stress is not a new concept. We live in a stress-inducing world in which we are constantly exploring new ways to improve mindfulness and restore feelings of well-being. 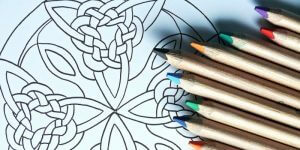 Coloring is just one of the increasingly varied ways in which we can pursue mindfulness. Traditional mindfulness techniques focus the mind in order to promote the self-regulation of attention. Through meditation, a state of relaxation can be achieved by focusing on the present and blocking out external distractions. Mindfulness coloring is no different. As with meditation, mindfulness coloring allows us to switch off extraneous thoughts and focus on the moment. It has long been recognized within both Jungian and transpersonal psychology that self-expression through artistic, visual means can be potentially therapeutic (Mellick, 2001). Curry and Kasser (2005) indicated that the positive effects of mindfulness coloring occurred when there was a challenge-skills balance. An image which is complex and structured enough that it requires a certain amount of attention to complete, is significantly more effective than one which is too simple or complex that it requires excessive thought or focus. If anxiety is a type of ‘inner chaos’ (Grossman, 1981), it seems likely that a structured activity such as coloring a predetermined, complex design would help to organize that chaos. In the same study, it was noted that individuals who took part in free-form coloring – with no image to color, just a blank page – stopped periodically to tap a pencil, look around, and to consider what to color next. This suggested that complex, structured designs draw us into a meditative-like state while participants who decided what to draw for themselves may have experienced too many distractions and confusion about what to draw or color next. Much like other mindfulness activities, coloring directs our conscious attention away from ourselves and into the present moment. Bea (2015) stated that the focus of thoughts on a simple activity like coloring tends to relax the brain, thereby negating disturbances from our own thoughts and potentially negative self-appraisals. Developed by psychologist, Dr. Lawrence Shapiro, this collection of nine mindful coloring illustrations ranges in difficulty and complexity. 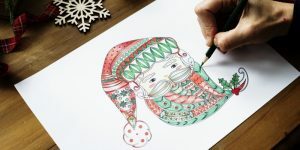 Beginning with some useful information about mindfulness and advice on how to approach your coloring in a mindful way, the varied images are sure to keep your mind focused. This intricate and detailed Swirling Leaves Mandala is complex enough that coloring will take some time. As is the Secret Garden collection, described as therapeutic and fun, these printable coloring pages include detailed hand-drawn illustrations of woodland scenes, a geometric owl, and flora. Created as a mindfulness resource to give children the opportunity to learn awareness in the moment and reflect on their feelings and thoughts, this collection of free PDFs is also great for beginners. Twelve animals are available, including an elephant, dragonfly, fox, iguana, rhino, and a turtle. The wealth of mindfulness coloring books currently available ensures the choice available won’t be reminiscent of the books you remember as a child. These intricately designed books have been created specifically to help you focus your mind. The following mindfulness coloring books were chosen for their structured yet creative illustrations. This list is by no means exhaustive, more a guide to get you started and to demonstrate that there is something out there for everyone to enjoy. Much contemporary art therapy literature promotes the coloring of mandalas as a method of alleviating stress and anxiety, and improving mood (Mantzios & Giannou, 2018). The Stress Less Coloring: Mandalas is a collection of 100 geometric mandala designs for you to color while you to concentrate on the details and quieten the mind. The Colour Yourself Calm: A Mindfulness Colouring Book includes a beginner’s guide to practicing simple mindfulness techniques whilst coloring. The book consists of double-page spreads of full-color mandalas with a black outlined copy of the image on the adjoining page for you to add color to as you wish. Coloring the symmetrical form of the mandala with its repeating patterns and complexity purportedly helps draw us into a state similar to meditation (Chaudhary, 2012). The Earth and Space Coloring Book includes photographs from the NASA archives with an adjoining illustration of the same image for you to color. This book features images taken from the Hubble telescope ranging from views of Earth, Jupiter and Saturn to beautiful star clusters, nebula, and supernovae. The intricate, detailed illustrations will require a certain amount of attention to complete. Modern Meditation: Coloring For Focus and Creativity by psychologist Stan Rodski contains more than 75 unique patterns designed to focus your brain through pattern, repetition, single focus, and creativity. Specializing in neuro-scientific research, Rodski draws inspiration from the study of neuroscience to guide you through this mindfulness coloring activity. Every inch of Enchanted Forest: An Inky Adventure is primed for coloring – including the front cover. The intricate, hand-drawn flora and fauna illustrations take you on a fun journey through an imaginary enchanted land. The delicate designs invite you to peer closer and discover the hidden intricacies within each illustration. Just Add Color: Mid-Century Modern Animals is a little bit different. Consisting of mid-20th century inspired designs, artist and illustrator Jenn Ski has created a book that is a lot of fun. Packed full of quirky illustrations with a retro twist, the illustrations lend themselves to complete freedom of imagination. The handy perforated pages mean you can easily frame and hang your masterpiece. The Mindfulness Coloring Book for Children is a great way to introduce mindfulness to children. This book consists of simple shapes and patterns designed to enhance concentration skills and mindfulness. Each image in Mindfulness for Children is single sided and easily removed from the book, meaning it can be framed and displayed with pride. In mindful drawing, the principles of mindfulness are applied to mark-making. A mindful drawing exercise is one that helps bring attention to the present by focusing on what you are drawing and using all the senses, not solely what you see. Greenhalgh (2016) described the practice of mindfulness through drawing as one in which you lose yourself to the movement of your pencil gliding across the page, the coordination of eye and hand, and the observation of the object being studied and drawn. Mindfulness drawing can be structured in one of two ways, the first being to doodle without plan or purpose. Drawing, shading, and coloring in whatever way feels pleasant, affords an opportunity to learn more about ourselves. There is no right or wrong way to doodle, it’s all about drawing what you feel and exploring your creativity. The second and most fruitful way is to draw from real life. Life drawing requires more conscious concentration and observation of what we really see – not what we think we see (Grant, Langer, Falk, & Capodilupo, 2011). Forget what you think a face, a hand or a leaf looks like, and really pay attention to it before making a mark on the paper. Change the angle at which you look at a flower, for example, do you notice anything different from this new perspective? You might, for the first time, really see the texture of the petals, the subtle variations in their color. By taking time to slow down and observe you will undoubtedly notice those tiny details you never noticed before. By letting go of pre-conceived ideas, we can start to see things as they truly are. Some artists say that you never really see a person until you draw them. It’s certainly true that drawing from real life can open your eyes to a whole world of detail that you never noticed before. It is important that you stay in the present moment and remain non-judgmental about your own abilities. Avoid thinking about previous experiences, telling yourself that you can’t draw and thinking too much about the end result will take you out of the moment. Being non-critical can be difficult, but the absence of judgment is an intrinsic part of mindful practice. Think outside the box. There are many techniques that can encourage more abstract creative thinking. Drawing using only straight lines, with the pencil never leaving the paper, or using dots instead of traditional shading techniques will add a new dimension to drawing that can help improve focus. Before you put pencil to paper, sit quietly for a few minutes and observe the space around you and the object you intend to draw. How does it feel in your hands? Try to look at it in a way you haven’t before. What do you see that you have never noticed before? Remember, there is no right or wrong way to draw. The end result isn’t the primary goal with mindful drawing; rather it is the process of focused drawing that is most important. Throughout the history of psychology, as with any science, metaphors have proved an invaluable way of connecting the unknown to the known. The mindfulness jar is no different. Symbolizing how one’s mind looks and feels when it is full, busy, and unfocused compared to when one is mindful and self-aware, the mindfulness jar is an excellent analogy to explain the unfocused mind. You have most likely shaken a snow globe until a little tornado of snowflakes begins to swirl around inside. Have you ever watched it until the flakes settle back down to the bottom? By comparing our own thoughts and emotions to the chaotic snow inside the globe, we can better understand that just as the globe becomes settled and clear again, so too will the mind. Designed to soothe and relax, the swirling patterns created by the colors and glitter in mindfulness jars have proved beneficial for both children and adults, assisting with a whole range of issues from anger control to anxiety. Coholic (2011) introduced the mindfulness jar to children as a means of improving self-awareness and resilience. Using a glass jar half filled with water, the children were asked to assign a thought or feeling to colored beads, then add them one-by-one to the jar. When each child had added a bead, they were encouraged to shake the jar, look at the contents and concentrate on what they were doing, then pass it on to the next child when the beads had settled. The discussion that followed compared the swirling chaotic contents to an over-stimulated mind. This visual aid can help explain how the mind is affected by negative emotions like anger or frustration. When the jar is unshaken, the contents peacefully remain at the bottom. When shaken the jar represents the muddled thoughts that prevent us from thinking clearly. The mindfulness jar is an effective way to orient mindfulness by encouraging a greater awareness of what we are feeling, thinking and doing in the present moment. It can also be of great assistance to controlled meditative breathing. While you watch the contents settle, take deep, calming breaths – experience each inhale and exhale as it happens. There are literally thousands of mindfulness jar recipes available and much like selecting a recipe for baking a cake, we will all have our own personal preference. The following recipe can be used as a guide for you to add your own personal touches. Let your imagination go wild! A bottle or jar with a tight-fitting lid. There will be a lot of shaking so it’s best to keep the contents where they’re supposed to be, not over the floor. When making a jar for a small child it may be best to use a plastic bottle to avoid any breakages. Non-toxic clear PVA glue. The more glue you add, the more slowly the contents will fall to the bottom, but be careful not to add too much or it will become too thick. A good rule of thumb is to use 1 part glue to 2 parts water. Glitter. Use a combination of fine and large glitter so that it falls at different rates when settling. Traditional glitter is considered a problem plastic so if you can, opt instead for biodegradable glitter. Warm tap water (warm water assists the binding together of other ingredients). If you are using a bottle with a narrow opening, whisk up the ingredients in a separate jug then funnel the mixture into your chosen container. Fill your jar with warm water until it’s about ⅓ full (more water will be added later, but you don’t want to overfill the jar at this point). Add about the same amount of PVA glue. Add your glitter – as much as you like and any colors you like. Start with a few tablespoons and continue to add more until you are happy with the appearance and consistency. Add 1 or 2 drops of food coloring. Avoid adding too much as the water/glue mixture will become too dark to see the other contents. At this point, you can add a few drops of liquid soap if you like. Liquid soap gives a shiny, galaxy effect and slows the movement in the jar without making the mixture too thick. Top up with warm water until the jar is almost full, close the lid and shake. I mean really shake. Remove the lid and let it cool. Once cool, tightly secure the lid and give it a whirl. Shake the jar up until the glitter is spinning wildly. Set it down and watch until the glitter and your mind are settled and calm. Focus on slowing down your breathing as it falls to the bottom of the jar. Keep your attention on the contents and try to ignore external distractions. If you are making a mindfulness jar for a child, include them in the process, it’s a lot of fun. Pocket-sized mindfulness jars are excellent to take with you on the move – smaller scale versions can be made using spice jars. Try sealing the lid with a hot glue gun if your jar needs it. Within chromo-therapy (also known as color therapy) it is proposed that the seven visible colors of the spectrum (red, orange, yellow, green, blue, violet, and indigo) can enliven the mood or quieten it (Birren, 2013). It is suggested that blue tones are linked to calmness, while indigo encourages creative visualization. Why not try using different colors and see if you find them more calming or energizing than others? The traditional paper-folding process known as origami has been a part of Japanese culture since the 6th century. Handmade paper was seen as a luxury and so origami was initially restricted to ceremonial purposes due to the expense of the material. During the late 1800s, origami was introduced to the Japanese education system as a method of improving concentration and patience in children. Origami is known to assist with hand-eye coordination, concentration, and memory (Lang, 2009). However, a new modern take on this ancient practice indicates that origami is also a useful mindfulness tool that retains your focus in the moment. Seneviratne (2018) suggested that origami trains the mind to treat things with care and is an effective mindful communication tool. As with other mindfulness techniques, origami enhances our focus and awareness of what is happening in the here-and-now. With patience and practice, origami can produce effects similar to those found in focused attention meditation – the practice of sustaining selective attention moment-by-moment on a chosen object, like the repetitive tick of a metronome. In his book of Mindful Origami, Samuel Tsang emphasizes the importance of acknowledging the process as you make each fold – study the lines, be aware of the texture, listen to the sounds as the paper folds. If you have never folded before but would like to learn, there is a whole range of tutorials and instructions available that will suit any learning style. This tutorial from Origami.me gives a comprehensive run through of the most common origami folds and models, from the traditional crane to a jumping frog. The simple instructions and clear step-by-step diagrams show how each design should progress when you first begin to practice the art. There is also a huge selection of video tutorials to help you create anything from amphibians to mythological creatures at all skill levels. Origami isn’t just about making elaborate creations, sometimes simple is best. This eight-step origami fox tutorial is great for children and beginners – as is this useful origami envelope tutorial. Origami-fun has a solid collection of instructions ranging in difficulty from beginners to advanced, including tutorials on folding birds, flowers, and much more. These free printable instructions are a great way to learn how to create beautiful origami models. By following clear steps or by watching the video tutorials, you can create little works of art from nothing but a sheet of paper. If you are experienced in the art of origami, why not try this software. Designed by origami expert Robert Lang, the TreeMaker program allows you to design your own geometric origami patterns based on mathematical theory. This certainly isn’t for everyone, however, if origami and mathematics are your ‘jam’ then this could be just for you. Not all mindfulness practices require a yoga mat and a quiet room. If you knit, you already understand how contemplative a craft it is, requiring complete concentration on the repetitive formation of stitches. As you discover your rhythm, background noise fades away and you find yourself quiet, focused and engaged in the moment. When you consider knitting in this way, it’s easy to see how it could be used to cultivate mindfulness – and it can be done almost anywhere. Those familiar with meditation practices will know that mindfulness meditation for beginners is often as simple as sitting quietly, focusing on breathing in and out, and observing the sensations. The practice of knitting compels you to pay attention to your own rhythmic, repetitive movements – effectively harmonizing the mind and body. Manning (2011) compared knitting to traditional Shambhala Buddhist meditation. This basic form of meditation focuses on posture, breathing, and cultivating a feeling of connectedness with the object of your focus. In essence, the two practices create an opportunity for you to be quiet, still, and truly connect with the present moment. Knitting even has its own built-in feedback loop. If you lose focus for even a few seconds, it’s likely that mistakes will be made. When this happens you must remedy the error and continue with your efforts. Receiving clear feedback from the activity itself allows us to refocus and continually adjust our actions in order to succeed in a task, in this case – knitting. If you are new to knitting, it can seem a daunting practice. Casting on? Knit one, purl one? If these terms mean nothing to you, you are not alone. Fortunately, there are a multitude free tutorials and patterns available online to help guide you through the basics. This guide for beginners covers the four fundamental knitting techniques, gives advice on wool and needle selection, and provides two knitting challenges that are perfect for a first project. The best advice when beginning your foray into the world of knitting is not to try too much too soon. If you decide to knit a complex and elaborate pattern on your first attempt the challenge will likely be too demanding. Nothing is more likely to demotivate you than a perceived failure. A great first-time project is a patchwork quilt. Made from small squares and sewn together this kind of project not only encourages mindfulness but also fosters a sense of achievement through the regular achievement of smaller goals. Knitting aids can be adapted and modified for those with disabilities and limited dexterity from arthritis or Parkinson’s disease, for example. Knitting needles made from bamboo are much lighter and more pliable than aluminum, taking the stress off of your hands and wrists. Knitting belts help people with arthritis, tendinitis and other disabilities knit with less pain. If at this juncture, you don’t think knitting is the right practice for you, alternatives to traditional knitting are available and involve the same levels of focus and attention. Arm knitting, for example, requires no needles and allows for the completion of large projects in a much smaller time-frame. Macramé is a form of fiber art that incorporates the repetitive knotting of cord rather than stitches and is another great alternative to knitting for mindfulness. The tradition of counting down the days until Christmas is thought to date back to 19th century Germany when candles were lit to observe the days throughout December. Fast forward to the early 1900s and this practice had evolved into the first-ever printed advent calendars, a reminder that the greatest celebration of the entire year was approaching. In modern times advent calendars hiding chocolate, gin, and everything in between has become part of the seasonal prelude for children and grownups alike. The joy of opening an advent calendar never seems to lessen. For many, the festive season can be busy and overwhelming. This Christmas give yourself or your loved ones the gift of mindfulness by creating an advent calendar with a difference. A mindfulness advent calendar is essentially an alternative countdown to Christmas designed to remind you to pause and take notice of the present moment, because let’s face it, there is more than enough chocolate to go around at Christmas. A simple and effective way to create your mindfulness advent calendar is by selecting mindful prompts and observations, then sealing them up inside colored envelopes. If you feel inclined to do so, the envelopes can be replaced with simple origami envelopes or shapes which, when unfolded reveal some words guiding you to be mindful. When your mindful messages are written down, write a date on each envelope. Use string and some pegs to hang your mindfulness calendar with pride. Think about a task you usually complete with little or no conscious attention and choose to pay attention to the small details. When making your morning cup of coffee ask yourself: What am I seeing, hearing, smelling, and feeling? Do you notice anything new? Pause and look around at your surroundings. Take a mental note of three things around you that you have never noticed before. Be aware of your body. Are you tense? Relax your shoulders and unclench your jaw. Make a conscious decision to move your limbs, take deep breaths and observe the changes in how you feel as you do so. Sit quietly, pay attention to each breath you take. Be aware as each intake of air flows through the nose and into your lungs. Slowly exhale and repeat several minutes. Before eating take a moment to savor the aromas, pay attention to the colors – really try to notice the food on your plate. How did this make you feel? Think about your emotional state right now. If what you felt was a color, what would it be and why? Close your eyes and sit quietly. Notice the texture of your clothing and how it feels on your skin. Do you notice anything you didn’t before? Hold a small object in your hand like a coin or a key. Notice the weight, the shape and think about how it feels in your hand. Mindfulness is not likely to happen overnight; however, incorporating practices like the mindfulness advent calendar into your life can aid its development over time with practice. This Mindfulness and Creativity talk by Austin Shaw, founder of Creativity Matters, discusses the concepts of mindfulness and creativity and how we can engage with both as a vehicle for enriching our lives. Not all art requires an extensive time commitment or innate talent. You might think you can’t draw particularly well, but this TEDx Talk by Graham Shaw shows everyone that they can draw. Drawing is, after all, merely making lines on paper. Practice some of the techniques in this short video and you will undoubtedly see improvements in your skills and confidence. This short video makes up part of a TEDEd lesson on why sketching and drawing is an important practice to develop. The observing and sketching of something we see every day inevitably leads to focused attention on aspects of daily life that may otherwise go unnoticed. This origami TED Talk is made by one of the world’s leading masters in the art of contemporary origami, Robert Lang. Once an avid student of the traditional paper-folding art, his repertoire contains some of the most complex origami designs ever created, combining aspects of mathematical design with an Eastern emphasis on line and form to yield impressive models. While we aren’t all on Lang’s level, this talk is sure to be an inspiration. Art psychotherapist, Carol Hammal, describes how art changed her life by improving her physical and mental well-being, and how it can have the same impact on yours. A World Beyond Creative Expression looks at art from the guided art therapy perspective, however, many of the points made are relevant to achieving mindfulness through non-guided creativity and art. Artistic pursuits can present an alternative path to mindfulness for those who are apprehensive about other mindfulness practices. By participating in creative activities like coloring, origami, and knitting we provide ourselves with a route to this powerful state of mindfulness and the many benefits that accompany it. I hope that having read this article, you begin to see how engaging with mindfulness through creativity has a variety of benefits and positive outcomes. Through focused observation, we can let go of pre-conceived ideas and begin to see things as they truly are. Allen, P.B. (1995). Art is a Way of Knowing: A Guide to Self-Knowledge and Spiritual Fulfillment. Boston: Shambhla Publications, Inc.
Barrett, C.A. (2015). Adult coloring books: Patterns for stress relief. Phi Kappa Phi Forum, 95, 27. Bea, S.M. (2017). The practices: Happy, Healthy Things You Can Do for Yourself. In B. Kanter & A. Sherman (Eds.). The Happy, Healthy Non-Profit: Strategies for impact without burnout, p.81. New Jersey: John Wiley & Sons. Birren, F. (2013). Color Psychology And Color Therapy; A Factual Study Of The Influence of Color on Human Life. San Francisco: Pickle Partners Publishing. Caholic, D.A. (2011). Exploring the Feasibility and Benefits of Arts-Based Mindfulness-Based Practices with Young People in Need: Aiming to Improve Aspects of Self-Awareness and Resilience. Child Youth Care Forum, 40, 303. Chaudhary, N. (2012). Mandala: A tool for self-discovery. The Scientific Ravi, 146-164. Curry, A.N. & Kasser, T. (2005). Can Coloring Mandalas Reduce Anxiety? Art Therapy: Journal of the American Art Therapy Association. 22. 10.1080/07421656.2005.10129441. De Dreu, C.K.W., Nijstad, B.A., Baas, M.,Wolsink, I., & Roskes, M. (2012).Working memory benefits creative insight, musical improvisation, and original ideation through maintained task-focused attention. Personality and Social Psychology Bulletin, 38, 656–669. DeLue C. (1999). Physiological effects of creating mandalas. In Malchiodi C., (Ed.). Medical Art Therapy with Children, 33–49. London: Jessica Kingsley Publishers Ltd.
Fogo, L.G., (2009). Engagement with the visual arts increases mindfulness. Honors Theses. Lang, R.J. (2009). Origami: 4. Florida: taylor & Francis Group. Grant, A.M., Langer, E.J., Falk, E., & Capodilupo, C. (2004) Mindful Creativity: Drawing to Draw Distinctions. Creativity Research Journal, 16, 261-265. Greenhalgh, W.A. (2016). Mindfulness & the Art of Drawing: A Creative Path to Awareness. U.K.: The Ivy Press. Grossman, F. G. (1981). Creativity as a means of coping with anxiety. Arts in Psychotherapy, 8, 185-192. Kalmanowitz, D. & Ho, R.T.H. (2016). Out of our mind. Art therapy and mindfulness with refugees, political violence and trauma. The Art in Psychotherapy, 49, 57-65. Killingsworth, M. & Gilbert, D.T. (2010). A Wandering Mind Is an Unhappy Mind. Science, 330, 932. Lebuda, I, Zabelina, D.L., & Karwowski, M. (2015). Mind-full of ideas: A meta-analysis of the mindfulness–creativity link. Personality and Individual Differences, 1-5. doi.org/10.1016/j.paid.2015.09.040. Manning, T.J. (2011). Mindful Knitting: Inviting Contemplative Practice to Craft. Clarendon: Tuttle Publishing. Mantzios, M., & Giannou, K. (2018). When Did Coloring Books Become Mindful? Exploring the Effectiveness of a Novel Method of Mindfulness-Guided Instructions for Coloring Books to Increase Mindfulness and Decrease Anxiety. Frontiers in psychology, 9, 56. doi:10.3389/fpsyg.2018.00056. Mellick, J, (2001). The art of dreaming: Tools for creative dream work. Berkeley, CA: Conari Press. Naghshineh, S., Hafler, J. P., Miller, A. R., Blanco, M. A., Lipsitz, S. R., Dubroff, R. P., Khoshbin, S., & Katz, J. T. (2008). Formal art observation training improves medical students' visual diagnostic skills. Journal of general internal medicine, 23, 991-7. Peterson, C. (2014). Mindfulness-Based Art Therapy. In L. Rappaport (Ed.). Mindfulness and the Arts Therapies: Theory and Practice. London: Jessica Kingsley Publishers. Schonert-Reichl, K. & Lawlor, M. (2010). The Effects of a Mindfulness-Based Education Program on Pre- and Early Adolescents’ Well-Being and Social and Emotional Competence. Mindfulness. 1. 137-151. 10.1007/s12671-010-0011-8. Seneviratne, K. (2018). Mindful Communication for Sustainable Development: Perspectives from Asia. India: SAGE Publishing Ltd.
Excelent article, Inspirational and very useful and clarifier.